With the opening of training camp 11 days away, the Pacers are out to embark on their most anticipated season since 2013, and one that inspires more optimism than all but a few since the turn of the century. Kevin Pritchard, the team's president of basketball operations, made moves a year ago in his first summer on the job that helped propel the team to a 48-win season that far surpassed general expectations. This summer he has reshaped the bench via the draft and by replacing three popular and productive players in Lance Stephenson, Al Jefferson and Glenn Robinson III with Tyreke Evans, Kyle O'Quinn and Doug McDermott. 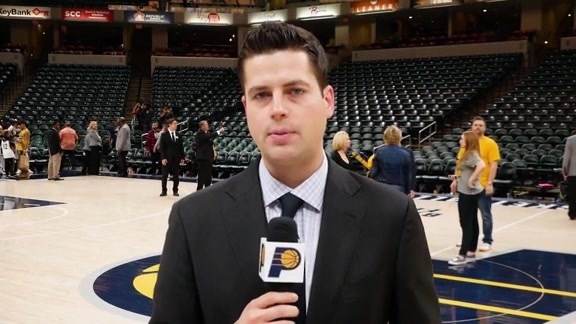 Pritchard sat down with Mark Montieth of Pacers.com on Friday to discuss the passing summer and an upcoming season in which the Pacers will face heightened expectations and attempt to progress beyond the first round of the playoffs for the first time since 2014. Mark Montieth: You had stated at the last press conference that you're done with personnel moves. Has anything come up since then that you considered, or that you might want to do in the near future? Kevin Pritchard: There's always chatter throughout the year. Some teams are looking to maybe clean up their roster. Maybe they've added something and their depth chart changed. But in late July or early August we made the decision this is our team and we're going to stick to it. We're going to give these guys a chance. Our whole theory was, let's keep the top seven in terms of minutes played. I'm not saying terms of importance, but minutes played. And then in terms of the bench, we really felt we needed some depth help. We needed scoring with that second unit. Tyreke's (Evans) a really good playmaker and Doug McDermott is underrated as a scorer. He knows he's got some weaknesses and we've got to work on that. And Kyle (O'Quinn) … we spend time with these guys before we sign them and we lay it out. Sometimes I wonder how guys come here because we're so transparent. With Kyle we said, "We don't know if you're going to play a minute or 500 minutes, but there's a role that Al Jefferson held last year that was a tremendous role for us that's so important." Leaving that dinner I thought, 'We were so honest with him, I don't know if he's going to come.' And then in an hour he said, "I want to be part of that." Once we signed those guys after the draft, we kind of knew we were done. There's always offers coming in. We're not making any outgoing offers. We like our team right now. Those seven guys who came in here last year and overachieved according to expectations, I feel they deserve to be together and see what they can do with continuity. Continuity ... there's been studies on it many times, about coming back with your seven, eight, nine top players, and trying to assimilate some of your other players and see if you can get them to conform to what your culture is about. We work on our culture. We're probably over-concerned at times with how things will fit. We're not a team that looks at players and says, "This is the best talent, throw them out there." We talk about how guys fit together. MM: Given that, how hard was it to make any changes at all? You could have brought back the same team and probably been justified in doing that because you had such a good thing going. KP: It's always a balance, right? With Lance (Stephenson), we had a lot of conversations with his agent and with him during that time. There was a chance we were going to bring him back, but I think he got that call from LeBron or LeBron's agent. That was a powerful thing, and we don't blame him. It was misconstrued a little bit how I feel about Lance. Lance meant a lot to this organization. I kind of looked at it like this will be his home. Larry Bird drafted him, we spent a lot of time developing him, he left and then he came back … and with Lance, one of the great things is when you get to the playoffs, you need a little X-factor. And Lance was that X-factor. We feel like Tyreke can do a lot of that. He's a heck of a shooter now. He's changed his game. You can't go under the pick and roll with Tyreke now. You have to go over because he's one of the elite pull-up dribble three shooters off the pick and roll now. That's a skill that's really important now. If he goes over the top and it's Domas (Sabonis) that's playing with him, that creates a lot of angles and puts the defense in tough positions. It's always a challenge. You're always looking to upgrade but you're looking for continuity. We said all along, we wanted to bring back our top seven. But we didn't have control over two of them - Thad (Young) and Cory (Joseph). Once we knew they were going to opt-in, we could be sort of calm and we didn't have to find that starting four or that backup point guard. I like our balance of youth and experience. But you're always fighting that as well. You look for guys in their prime and still playing well and not on the decline, but you fill them up with guys who are coming. That's a challenge as well. MM: If Lance had not gotten that phone call from LeBron, would he be back? 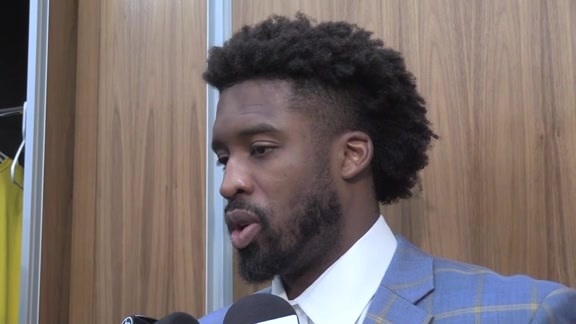 MM: You had not talked with Tyreke's agent before that? KP: We had. During that time you're making a market in the sense you're in constant communication – with the top agents, it's literally every hour. Where's he going? Chad (Buchanan) does a great job, Peter (Dinwiddie) does a great job of staying connected with what the market is saying. You're always going with a plan. Here's Plan A, Plan B, Plan C. But it's like Mike Tyson says, everybody has a plan until you get punched in the face. And then everybody changes. We try to stay opportunistic. We spend endless hours, looking at Scenario A, Scenario B, Scenario C and sometimes it gets overwhelming. But what it helps get you to, you realize there are certain things that could happen, and if they happen this could happen. That's what I try to get to - if he's going back and he's going back and there's this much money left in the market, here are some players who could be part of this. We don't aggressively pursue certain players. We want guys to fit here. I can't emphasize that enough. MM: There seemed to be a misunderstanding with Lance at the time. Have you had a chance to communicate with him since then? KP: I did. I did that press conference and I said sometimes he's the best player on the other team. It was a joke. I called him immediately and we spoke and I completely apologized and we're great now. We wish him the best. We're going to miss some of his … he brings a unique characteristic to the game, that's for sure. One thing I have a lot of confidence in, we really set what "Three T" is about. It's kind of our internal compass. Our players bought in last year and that will trickle down this year. KP: It's what we talk about with every player. We find that when a player comes here, I want them to know what the Indiana Pacers are about. I don't talk publicly about it. We bring players in, we talk to them what the Pacers are about. We have a great dialogue. They have a lot of input on what Three T is. And Victor (Oladipo) and Myles (Turner) and Domas and Thad and Darren (Collison) completely bought into it last year. It's funny, because it really grew on its own. Now we talk about it in terms of scouting. Is he Three T? It's part of our internal culture that we think is super important. MM: Three words that begin with T, I assume? KP: Yes. But I want to keep that internal. MM: You mentioned McDermott earlier. He's the one new guy people seem to be questioning. You gave him a good contract, you committed to him. People say he's a poor defender, that he's just a 3-point shooter. What do you see in him that perhaps other people do not? KP: It's interesting because any time you look at a player … when we did the trade of Paul (George) for Victor and Sabonis, the level of their production value wasn't equal. Paul was (better). But sometimes you say, "Can we help him maximize what his talent level is?" That's what we did with Victor and I think we're doing it with Domas. And the executive staff and our coaching staff, we're about defense here. We have to score points, but we watch the defensive side of the ball in a league that's about scoring right now. I have a lot of confidence that Doug can become a better defender, especially a better team defender. But he's going to have to work at it. We needed shooting in that second unit. We needed it desperately against Cleveland (in the playoffs). When they took Victor out of the pick and roll by doubling it, we needed another playmaker and we needed another guy who can shoot it. Doug can really light it up if he gets open and sets his feet. Tyreke is a playmaker, but he's become a shooter, too. We have a lot of options to end games. Sometimes that's good and sometimes it's not. We have nine free agents on our team. We're obsessed with making sure everybody plays the right way and buys into the team. A high tide lifts all boats. MM: Did the way McDermott was used in Dallas influence you're thinking in what he can be? KP: No doubt. I thought the way Rick (Carlisle) used him in Dallas, getting him in movement, pin-downs, spacing at times … and he's a sneaky runner. Ten years ago everybody ran for layups. Now everybody runs for corner threes or angle threes. I think Nate's going to have to look at some things, whether they're running for threes or for layups, too. I feel like we have more ammunition to put out there offensively to compete with these higher-level teams. MM: Last year, the consensus in the executive offices was that your win total would be in the mid-thirties or upper thirties. What's it going to be for this season? KP: You sound like Herb (Simon, owner). Herb asks me that all the time. The truth is, it's totally just a guess. I guess so much of our business is trying to predict how a player will be here. I worry about three things every day. If we do those three things we'll be just fine. If we play hard, play smart and play together, the wins will take care of themselves. We lost a few games in a row last year, but I wasn't worried because I thought we were playing the right way. Then we went on a four-game losing streak and I didn't know if we were playing the right way. I was more worried then. So sometimes I get really worried if I see us not playing the right way. KP: Have you ever been part of a team where you win less games but you're more prepared for the playoffs? MM: I've seen teams like that, sure. KP: Me, too. I don't want to see us win 50 games and not be more prepared for the playoffs. I was very lucky. I was coached by some very good coaches … Larry Brown, Coach (Roy) Williams, Gregg Popovich … some of the great coaches. Sometimes they sacrificed some stuff in the middle of the season to make sure there was an opportunity to be right at the end of the season, which is what we're all about. Getting to the playoffs. That's our goal. We want to get to the playoffs, because you have to get to the playoffs to get to the second round. There are so many variables. Health. Are you clicking at the right time? It's crazy, you look at teams that are clicking at the right time and it's amazing basketball. Everybody is shooting the ball well, they feel good about themselves, they feel fresh at the end of the year. My goal is to get to the playoffs and be prepared to succeed in the playoffs. That doesn't mean winning 50 games, it means getting to the playoffs. MM: What's the impact of having so many guys with a one-year contract or are in the last year of a contract? It seems like it could go either way. They're motivated, but they might be wanting to score more. Nate and I and (other executives), we talk about it all the time. It's the thing we obsess about the most. We try to confront it and speak about it head-to-head. I speak to every player all the time. I try to set the expectations of what we expect this year. When I see things I really like, I try to tell that player. And when I don't like it, I tell that player. Nate had a team in Seattle that had like 10 free agents and they had 52 wins. He got everybody playing the right way, playing together. You look at what happened that summer … Ray (Allen) got a contract, Reggie Evans got a huge contract, Rashard Lewis … everybody benefitted from the team playing well. At the end of the day, general managers and presidents look and say, "That team's successful, why did they have success." It's because of this and this and this. We've become more savvy about that, I think. It's something we're worried about, but I have a lot of faith in the baton of leadership being passed. Last year, Al had a big role, but so did Thad, so did Victor, so did Cory. It's not a complete change of leadership, it's a few guys taking the baton a little more. And, quite frankly, Victor sets the tone for a lot of things around here. I give him a lot of credit. But I don't believe he was the sole reason for last year. We're about team. It wasn't just Victor. It was Domas and it was Thad and it was Myles and it was Darren … that's why we won. MM: Speaking of Victor, what's the expectation for him? How much better can he be? KP: We challenged him. Victor's not the kind of kid that when I talk to him wants to hear how great he is. He's got an internal compass that's a strong confidence in himself and his abilities. I never worry about that. I don't worry about his work ethic. I don't worry about him as a great teammate. Of any player I've ever had, whatever his ceiling is, he's going to get to it. He's obsessed with becoming a great basketball player. He's had a helluva off-season. He'll go through some ups and downs like every player does in this league, but I have faith he'll bounce back quick. I just think he'll take the baton of leadership. My challenge to him is this. I played with Larry Bird. He was the best player I had ever played with. Him and Danny Manning in college (at Kansas). And those two had one specific thing that they did that was incredible, and that's when they stepped on the court the other four players thought they were better. When I played with Larry I was just a little bit better. When I played with Danny, I was just a little bit better. That will be his next growth. He steps on the court and the other four guys go, "I've got this guy in my trench? We're going to be OK tonight." I don't want to put it all on him, but good players do for themselves and great players do for others. He's got the opportunity to do that. MM: But for that to happen he's got to be able to pass out of the double team and create shots for people. KP: I don't worry about Victor's numbers. I worry that if they (the defense) are taking him out, are we punishing them with the other four players? Is he making the right play? And how are we attacking? When you play four-on-three, somebody's going to get something good, if you make the right reads. You saw Cleveland, the way they double-teamed and got him out of the game, we had to get another playmaker, we had to get another shooter. Those things, hopefully, make us better. MM: What have you heard about the workouts in Miami that he organized? KP: He did it on his own. We provided some support. Very little. That needed to happen organically. That was theirs and they set the tone. The players get the credit. MM: When you say provided support, what do you mean? KP: We sent balls and we sent our training staff to make sure they were being taken care of when they did their workouts. But the coaches weren't there. The executive staff showed up one day to say hello and then we left. MM: What did you hear came out of those sessions. KP: I think it was pretty competitive (smiling). I think they're excited to compete against each other in training camp and then show what they've got. Darren Collison and I were talking and it still feels like we're a little bit of the unwanted and unloved. I'm OK with that. MM: When you get down to it, they lost in the first round of the playoffs, so it's not like they've done anything yet. KP: I think our players are still hungry. I want that. We might not be a team that's hunting. We might be hunted. But I believe this, we're still the unwanted and unloved. MM: With Myles, he's obviously worked hard this summer in Texas, based on the photographs he's put up on social media. What have you heard about his summer and what are you expecting from him? KP: I think he and Domas both had a great summer in terms of changing their bodies. Domas went down to Dallas. They've created a unique bond. I love that. That's super-important for us. I'll say this. You look at Victor's body of work … he changed his body, but the way he changed was he changed his mind. He made a decision mentally that I'm going to be the best worker, I'm going to be the first in the gym, the last in the gym, I'm going to do everything I can obsessively to have a great year. Myles has done the first step. He's changed his body. I have every reason to believe he'll change his mind, that he will be the physical player we need him to be. We need him to score some, but we need him to be the defensive anchor to totally disrupt the game on that side of the ball. He really can block shots. He can be the intimidator inside with his length and his athletic ability at the rim. I still think that's one of the most valuable tools in this league. I remember some of the elite guys in this league … Patrick (Ewing) and (Hakeem) Olajuwon and (Dikembe) Mutombo … they changed the game. You didn't go in (the lane). I want him to have that mentality, that I'm going to be elite on that side of the ball. If he does that, everything will take care of itself. MM: Are you hoping to sign him to an extension of his rookie contract, or is it better to wait until the season is over and see where things stand. KP: I never talk about that kind of stuff because it's very personal between the player and the organization. I would say this: we know he's part of our future and it's important for him to grow this year. I thought he played well last year in spurts. He's got to put it together, but we need to see a jump from him. MM: How committed are you to finding out if he and Sabonis can play together for long stretches of time? KP: That's a Nate question. I don't mingle in minutes. Never will, never have. If Nate asks me I'll give input, but I don't ever go down there and say, "Nate, you need to play this guy." But Nate and I have a shorthand communication. We've been together 10 years. We have this great dialog with one another. He can give his opinion and I can give my opinion and we can disagree and I trust him. One of the T's is trust. I trust him. I trust him implicitly. That coaching position is no joke. It is no joke. Done it. Don't ever want to do it again.